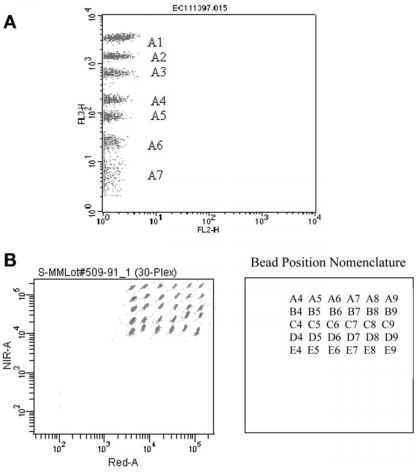 The standard provided with each Cell Signaling Flex Set is provided as a 50X bulk recombinant protein (50,000 U/mL) and should be serially diluted before mixing with the capture beads and the PE-detection reagent for a given assay. The protocol listed next indicates how standards should be mixed and diluted for use in a cell signaling Flex Set assay. Each assay (single bead or multiplex) performed in a given experiment will need to have a standard curve prepared. Each cell signaling Flex Set standard was assigned an arbitrary unit value. In each case, the unit potency of the Flex Set standard will be kept consistent from lot to lot. 1. Warm standard vial to 37°C and vortex to mix thoroughly. 3. Add 20 pL of each cell signaling Flex Set standard to be run in the experiment to the top standard tube. 4. Add assay diluent to the top standard tube to bring the final volume to 1 mL. Example: if five cell signaling Flex Sets are being multiplexed for a given experiment, 20 pL of each BD CBA cell signaling flex. Set standard needs to be added to the top standard tube (5 X 20 pL = 100 pL total volume) and will then add 900 pL of assay diluent (1 mL assay diluent - 100 pL [volume of standards added] = 900 pL assay diluent). 5. Add 500 pL of assay diluent to each of the remaining tubes. 6. Perform a serial dilution by transferring 500 pL from the top standard to the 1:2 dilution tube and mix thoroughly. Continue making serial dilutions by transferring 500 pL from the 1:2 tube to the 1:4 tube and so on to the 1:256 tube and mix thoroughly. The assay diluent serves as the negative control.